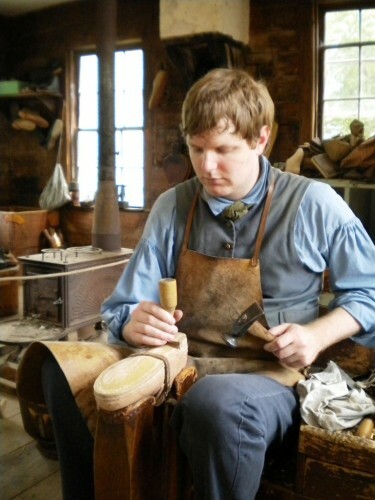 I was itching to get up to Old Sturbridge Village again. I love living-history museums. I’ve had a wonderful summer. Already I’ve hit Mystic Seaport nearly next door—the seafaring village of the 1800s. And Plymouth Plantation up in Plymouth, Mass.—the Pilgrims’ first crude settlement. 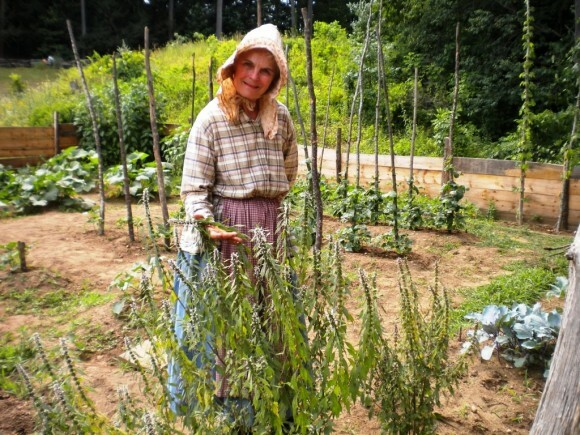 But now Plymouth Plantation pays a lot more attention to the local Indians. They helped the Pilgrims to tough it through. Well, those who didn’t perish that first winter. Now Plimouth shows Indian life, too. It’s the right thing to do. I know both places well. I always have a great time. So much to see. Best of all, the chance to experience those olden times. See how folks lived and toiled and coped. For a few hours to feel all that for myself. So, recently, I got up and saw it was a fine day. Perfect for my Old Sturbridge Village treat. The village, which is all about life in the early 1800s, is the oldest of its genre in the country, I believe. It’s right above the Massachusetts line, so quite a ride. I know that whole area well, but decades ago. 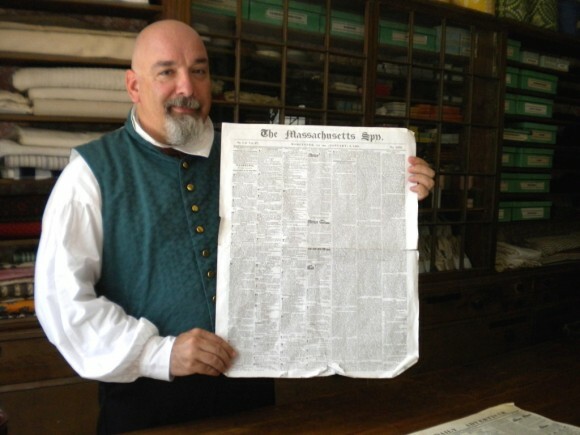 Back then I was the bureau chief in southern Worcester County for the Worcester Telegram & Evening Gazette and Sunday Telegram. A long name, I know, but it was a big paper, with morning, afternoon, and Sunday editions. 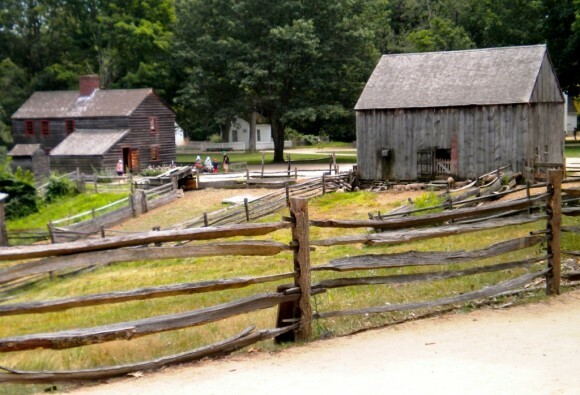 Old Sturbridge Village was in my bailiwick. We visited it as a young family. At least twice, I think. I left early. At 8 sharp. As usual I rode the back roads, meaning the slow roads, the delightful roads, all the way up. I’m a shun-piker. Stopped here and there at familiar spots and explored a couple of new ones. So it was noon when I pulled in at the village. Wow! The lot was jammed with cars. One quick look told me this was a much bigger place than I remembered. A long line at the ticket office. I noticed the price to get in. $24! A lot, lot more than the price I remembered. Prices nowadays are always a shock to me. I remember gas at 17 cents a gallon, apples at 3 pounds for 25 cents, and movies for a quarter. memory. But slowly, grudgingly, I am adjusting to gas at $3.49 a gallon and Mac apples at $1.59 a pound and movies at $8. Even the prices on my books are shocking to me, but, as I always explain, I don’t set them. $5 Friday! Just $5 for anybody! What a nice idea. Who doesn’t love a bargain? The village schedules a $5 Friday now and then. Behind me was a family with three kids. They’d be saving a bundle today. Maybe they wouldn’t be here if they faced the regular price. And this explained all the cars in the lot. Yes, a lot of people here. That might make it hard. As it worked out, not a problem. I expected a lot of walking. All those paths winding through the village. All the byways. Going into this house and that one.This visit was important to me. I was prepared to tough it. I had my sturdy walking stick. It helps a lot. I was sure I’d find a bench or a chair here and there. It worked out that way. This was an agrarian village. Farming was the whole economy. Raising animals and crops. In the winter, folks did repairs and improvements.The entire focus was on wresting a living from the earth. Farming set the lifestyle. The minister, the shopkeeper and a very few others toiled at their specialties. But even the blacksmiths and the coopers squeezed in some farming. I began walking. A gravel road, of course. No blacktop back then. A slight uphill, but not bad. So, no utility poles. No long wires looping through the village. No fire hydrants, of course. Or gas stations. Or supermarket. Or police or fire station. Or McDonald’s. Or beauty salon. None of all the things that we see every day and depend on. Strange. But I liked the beauty and simplicity and quiet of it. This was Old Sturbrige Village of the 1830s! As I walked up the path, little signs made this clear. The signs set the scene and the tone. They were not the exact signs. I don’t remember them. I made these up to give you the flavor. My first stop was at the Small House. Maybe it was the Smalls’ home. Not sure. Certainly it was very small. And modest. A sign said the kind used by a family of lesser means, or renters, or a colored family. I was surprised to hear about colored folks. But there were a few around, it sees. It was “The Frugal Housewife,” a tidy little volume by one Mrs. Child. No first name given, not even an initial. How about that? But very interesting. Life was so difficult, so different in so many ways. But it’s words on the second page that I really liked: “Dedicated to those not ashamed of economy.” How wonderful. More people today should be dedicated to economy. I just read that the average credit-card indebtedness in the United States is more than $8,000, and most people never pay it off…just roll it over from month to month. Sad. Others entered and she had to turn to them. 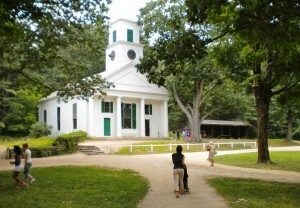 My next stop was at the Friends Meeting House up the slope on the right. Very small. Very basic. Not even a penny’s worth of ornamentation. I was surprised there were Quakers here. Dedicated to peace and non-violence. The small group would sit here in silence on Sunday mornings, all intent on communicating in individual privacy with The Spirit. No minister. All equal. If some felt so moved, they would say something aloud, a little prayer maybe, a bit of a hymn. Maybe someone else would be moved to say something. Maybe not. Then, spiritually refreshed, they would go home to pick up the grind of life and livelihood. She slipped her tiny fingers under the rail and snatched the feather and handed it to me. I smiled. “Thank you! Thank you!” I tucked it in my shirt pocket. I was so happy. I’ll tell you why in a few minutes. I kept making my way. Yes, many here today. For sure, $5 Friday was the big draw. But they just made the village look busy and interesting. Families but big groups, too. I’d seen big tour buses in the parking lot. I came upon 30 teenagers sitting on a lawn, picnicking. Asians. I asked a gal, “Are you from Japan?” Japan seemed logical. The Japanese are the most well to do over there. “No,” she said, shaking her head. “China!” She was so happy. Yes, the Chinese are doing fine these days. At the Knight Store, loaded with the simple goods of those times, the bearded Shopkeeper chatted with me at length. I visited many buildings. I enjoyed chatting with whoever was in charge. At the Shoe Shop. The one-room Schoolhouse—the teacher told me the pupils ranged in age from 5 to 17, and she was only 18. “That would not have been a problem,” she said. On I went to the Blacksmith Shop. The Pottery Shop. The Tin Shop. The Freeman Farm with the fat pig snoozing in the mud, and the six cows enjoying their hay. In the Farmhouse Garden two ladies in their long skirts were tending the plants. Really working at it. No making believe. I got the attention of the one close by. She straightened up and wiped the dust off her skirt. “Enjoyable work!” she said with a smile. “Truly it is. A woman at women’s work. Men were busy toiling at the real muscle jobs. I was impressed by these villagers. They were all working hard at their tasks. All were gracious. Eager to explain and answer questions. I was impressed by how savvy they were about those those times and what was involved. They weren’t just “winging it.” They took courses and studied. Several said they enjoyed digging in even deeper on their own. At some exhibits, there was no costumed villager on hand at that moment. But plenty of info on signs and in pamphlets. At the Bank, which issued its own “ paper money,” by the way. At the massive outdoor kiln where hundreds of pieces of pottery were fired at one time. At the stone-walled Town Pound, where stray farm animals were kept until claimed by their owners—who had to pay the pound keeper for the service and care. I gladly took a seat up close to him. Others got on. He picked up the reins and said “Giddy up!” And his two big horses stepped forward, smooth and easy. A nice ride. He paused here and there and explained, swiveling around and looking down at us, “That Mill Pond on the left was all-important. Man-made. Imagine the hard work of that. “Are your horses smart?” I asked. I noticed that the horses knew where to pause to sip water. They pulled right up to the trough and stopped and began slurping. And when the driver stopped to explain something, they’d patiently swish their tails. He’d say just one word and they’d stop. Another word and they’d move forward. Another word and they’d back up. Yes, back up. That impressed me. The Shopkeeper showed me the latest news from Boston. It arrived when it arrived. But few could read. Or had the time. I knew that was true for many of the buildings I had enjoyed. So, I made the winding circle with him again. He was right. I saw things I hadn’t noticed the first time. And major buildings that I would have loved to spend time in. The Sawmill. Gristmill. Bullard Tavern. Cooper Shop. Others, too. But no time. my car was one of the few left. It took hours to make one shoe. No difference between left and right shoes back then. A good thing the park was closing. I was pooped. I wasn’t up to much more. The next time! Even if it doesn’t happen to be a $5 Friday. Oh, now about my beautiful turkey feather. I’ve been writing for a living all these many years. Long ago, when I decided to get myself a business card, I thought hard about a suitable graphic to put on it. I had an artist draw one for me. She based it on a turkey feather. I still use a card with the quill pen on it. Letterheads, too. One birthday, a thoughtful person gave me a real quill pen with a pewter inkwell. An ornament I’ve kept on a bookshelf. The feather has become sadly ruffled. Now I have a dandy new feather. And it will be a nice reminder of my marvelous visit to Old Sturbridge Village.